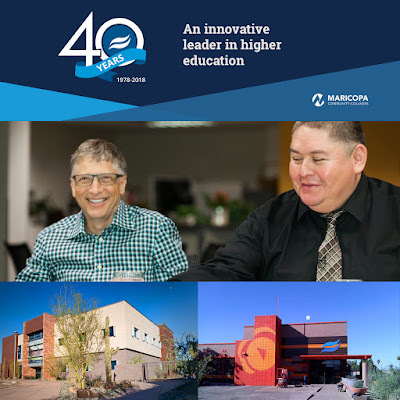 Today’s 40th anniversary trip down memory lane is taking us to 2012-14, when the college opened three new locations—and hosted a visit with Microsoft founder Bill Gates. Rio Salado was busy in 2012! In April, the college celebrated the grand opening of its Downtown and Thomas locations and Spot 127 Youth Media Center in Phoenix. The Downtown and Thomas locations provide adult basic education services like English as a second language and GED® test prep classes-- and programs to help these students transition seamlessly to achieve a college degree. 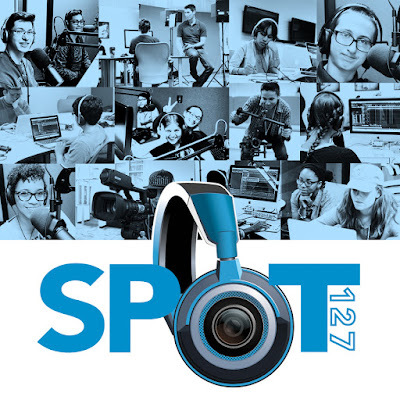 The SPOT 127 Youth Media Center, which is service of KJZZ 91.5 and Rio Salado College, was designed to offer an after-school digital media, radio and journalism program for high school students. In November 2014, Bill Gates, co-chair of the Bill & Melinda Gates Foundation, CEO Sue Desmond-Hellmann and other leaders from the Bill & Melinda Gates Foundation stopped by for a visit to get updates on college initiatives supported by the Foundation and to meet with students like Shawn Lee, pictured here next to Gates. Check out this related YouTube video and RioNews blog. Do you remember this time? Share your photos, stories and memories via email to RSCmemories@riosalado.edu or social media using the hashtag #RioSaladoCollege40th. Visit our 40th anniversary website to learn more about our year-long celebration 40.riosalado.edu. Photo of Gates with Lee courtesy of ©Bill & Melinda Gates Foundation/Michael Hanson.